Data and Voice connectivity is one of the most important aspects of your business, it is your direct connection to your customers and suppliers. Yet many businesses are held back by slow and poor quality connectivity to the outside world, and outdated telephone systems that operate in isolation to your IT Infrastructure. Let us deliver fit for purpose, high speed and reliable connectivity and modern feature rich, fully integrated business voip telephony solutions to allow you to communicate effectively, improve service to your customers, and grow your business. We have a comprehensive range of solutions so suit your requirements, and your budget. 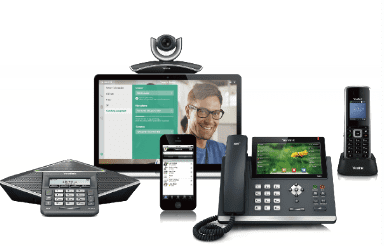 What is IP Voice (VoIP)? As a technology company, we understand IP networks better than anyone and have the skills and experience to offer fully integrated next generation IP voice solutions to our customers. In short, an IP Voice solution replaces your traditional hardware based telephone system that requires telephone or ISDN lines, with a system that requires no dedicated hardware other than the phones themselves, and operates over your existing IT infrastructure and Internet connection. IP Voice solutions are considerably cheaper than traditional telephony solutions, and offer improved functionality with close integration with your IT equipment, enabling features such as click to dial, and the ability to link satellite offices together using the same phone system, as well as allowing you to use your internal extension out of the office via your smart phone. Our IP Voice solutions include the following features. A range of phone hardware for every scenario. Time based call routing and auto attendant options. Call Groups, Hunt Groups, Call Waiting, Call Queuing and Music On Hold. Direct Dial numbers for each user as standard. Personal and Company phone book. Click to dial and PC companion app. Call Recording, statistics, reporting and wallboard telemetry. How reliable is IP Voice? Don’t be! IP voice is digital and uses the latest High Definition audio hardware and noise cancelling technology. Call quality and clarity far exceeds traditional telephone solutions. Can we keep our existing numbers? Yes, we can help you transfer any geographical or non geographical number, or Direct Dial numbers. This means that you don’t need to update any company literature, and you’ll never miss a call! What if my Internet Connection goes down? We recommend having two Internet connections with different suppliers for resilience, and since we provide a great range of connectivity options, we can help with that too. This means that should an issue occur with once connection, the other will allow you to continue to use the Internet and make/receive calls normally. Calls can also be diverted to another location immediately via the web based administration portal. What is we move offices? IP Voice is extremely flexible and relocating is simply a case of moving your phones from A to B, provided there is an Internet connection at your new location – that’s it! This flexibility is also useful as a Disaster Recovery solution should you main office become unusable. Our IP Voice solutions are cloud based, meaning that no central telephone system hardware is required. This simplifies the system with less components involved, but also reduces costs since there is no hardware to maintain. The only devices you need are the phones themselves, and we offer a great range of phone hardware to meet your requirements. Is it expensive to call overseas numbers? Because calls are routed over the Internet, calls to overseas numbers are significantly cheaper than via traditional telephone or ISDN lines. How much can costs be reduced? How do we migrate to IP Voice? We take care of everything for you, and plan the migration at a time convenient to you. We also approach the migration in way that ensures that your phones continue to operate throughout the process, you’ll never miss a call! Speak to our VoIP experts today.. Contact us today and find out how we can help. In case you didn't find what you were looking for.